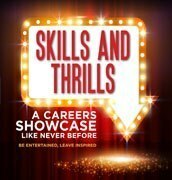 In its fourth year running the Skills & Thrills careers showcase, supported by the Department of Industry, will be taking careers advice out of the office and onto the big screen through an exhilarating film packed with music, video and animation. Skills & Thrills will be back bigger than ever in 2019 and we would like to formally invite your students to attend this FREE careers showcase. Students will find out the latest on jobs of the future, industry trends and how to connect passions to a successful career outcome. SkillsOne will showcase a variety of in demand Industry areas, with a focus to the needs of your region including; Healthcare, Tourism and Hospitality, Construction and more! Students will learn about career opportunities and avenues to go for training. All sessions are based on a first in best dressed scenario. Please feel free to bring whole year groups or more than one year group. Also keep an eye out for additional showcases coming to further New South Wales locations.